When an opponent's monster declares a direct attack: You can Special Summon this card from your hand. After damage calculation, if this card battled an opponent's monster: You can destroy that opponen..
You can Special Summon this card (from your hand or Graveyard) by Tributing 1 monster on either player's field with a Predator Counter. You can only Special Summon "Predaplant Drosophyllum Hydra" once.. When this card inflicts battle damage to your opponent: You can target 1 face-up monster your opponent controls; place 1 Predator Counter on it, and if it is Level 2 or higher, it becomes Level 1 as l.. If this card is Normal or Special Summoned: You can target 1 face-up monster your opponent controls; place 1 Predator Counter on it, and if it is Level 2 or higher, it becomes Level 1 as long as it ha..
Monsters with a Predator Counter that you use as Fusion Materials are treated as DARK. 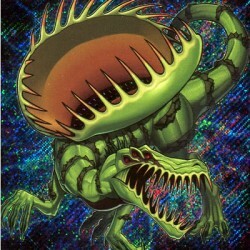 During your Main Phase: You can Fusion Summon 1 DARK Fusion Monster from your Extra Deck, using this card on the ..
Once per turn: You can target 1 face-up monster your opponent controls; place 1 Predator Counter on it, and if it is Level 2 or higher, it becomes Level 1 as long as it has a Predator Counter. At the .. This card gains 200 ATK for each Predator Counter on the field. When this card destroys an opponent's monster by battle: You can equip that monster to this card. Once per turn: You can target 1 Monste..
You can send this card from your hand to the Graveyard, then target 1 face-up monster you control; this turn, it can attack all monsters your opponent controls with a Predator Counter, once each. If t..
1 "Predaplant" monster + 1 DARK monster. Once per turn: You can target 1 monster on the field with a Level less than or equal to this card's; banish it. When an attack is declared involving this card ..
1 "Predaplant" monster + 1 DARK monster whose original Level is 8 or higher. Must first be Fusion Summoned. Once per turn: You can target 1 face-up monster on the field; until the end of this turn, ch..
Once per turn: You can Special Summon 1 Level 4 or lower "Predaplant" monster from your hand or Graveyard, but it has its effects negated (even if this card leaves the field). Once per turn, during yo.. If a monster with a Predator Counter leaves the field while this card is face-up on the field: Add 1 "Predap" card from your Deck to your hand. You can only use this effect of "Predaplanet" once per t.. When this card is Normal or Special Summoned: You can target 1 "Fluffal" or "Edge Imp" monster in your Graveyard; add it to your hand. If this card is sent to the Graveyard as a Fusion Material for a ..
During your Main Phase: You can Special Summon 1 "Fluffal" monster from your hand, except "Fluffal Penguin". This effect can only be used once while this card is face-up on the field. If this card is .. When this card is Normal or Special Summoned from the hand: You can add 1 "Edge Imp Sabres" or 1 "Fluffal" monster from your Deck to your hand, except "Fluffal Dog". You can only use this effect of "F.. When this card is Normal or Special Summoned from the hand: You can add 1 "Polymerization" from your Deck to your hand. You can pay 500 LP; Fusion Summon 1 "Frightfur" Fusion Monster from your Extra D.. If this card is in your Graveyard: You can place 1 card from your hand on the top of the Deck; Special Summon this card in Defense Position. You can only use this effect of "Edge Imp Sabres" once per .. When this card declares an attack: You can add 1 "Edge Imp Chain" from your Deck to your hand. If this card is sent from the hand or field to the Graveyard: You can add 1 "Frightfur" card from your De..
1 "Edge Imp" monster + 1 "Fluffal" monster. Once per turn: You can target 1 monster your opponent controls; send it to the Graveyard. This card cannot attack directly the turn this effect is activated..
"Edge Imp Sabres" + 1 or more "Fluffal" monsters. Must be Fusion Summoned with the above Fusion Materials and cannot be Special Summoned by other ways. This card can attack a number of times each Batt..
"Edge Imp Sabres" + 1 or more "Fluffal" monsters. When this card is Fusion Summoned: You can target cards on the field, up to the number of Fusion Materials used for its Fusion Summon; destroy them. A..
"Edge Imp Chain" + 1 "Fluffal" monster. If this card battles, your opponent's cards and effects cannot be activated until the end of the Damage Step. If this card is destroyed by battle and sent to th..
Once per turn: You can discard 1 card; draw 1 card and show it, then if it is a "Fluffal" monster, you can Special Summon 1 monster from your hand. Otherwise, discard the card you drew. If this card i..
During either player's turn: You can send this card from your hand to the Graveyard, then target 1 Fusion Monster you control; it gains 1000 ATK and DEF until the end of this turn. If this card is Nor..
"Aleister the Invoker" + 1 DARK monster. If a player's monster effect attempts to activate, none of that player's monsters can activate their effects for the rest of this turn while this card is face-..